Dartboard teams are allowed 60 seconds and one disc to score as many points as possible. A countdown of time remaining will be uniform for all teams: 30 seconds, 10 seconds (5, 4, 3, 2, 1, if necessary) and time. The handler and canine are required to be behind the throwing line before time starts. When the handler is ready, the line judge (timer) will give them the OK to start. Time begins when the dog crosses the starting line. The handler must be behind the throwing line (25-yards from center) for all throws, but may move freely around the field at other times. A throw will not be scored if the handler steps on or over the throwing line prior to or during the release of the disc. If the disc leaves the handler’s hand before time is called, it will be scored. 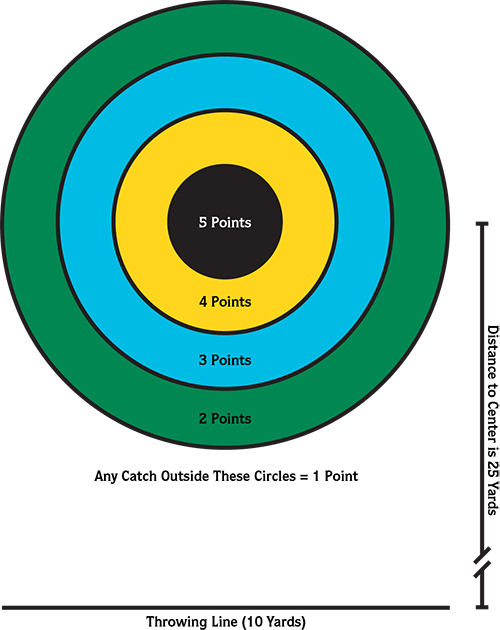 To receive points, catches must be completed with any paw landing within one of the official scoring zones (see diagram). If a canine catches a disc with paws in more than one scoring zone, the catch will be scored as if it were made in the higher scoring zone. Scoring is based on the following point scale.